SPJ DePaul Chapter T-Shirts on Sale! 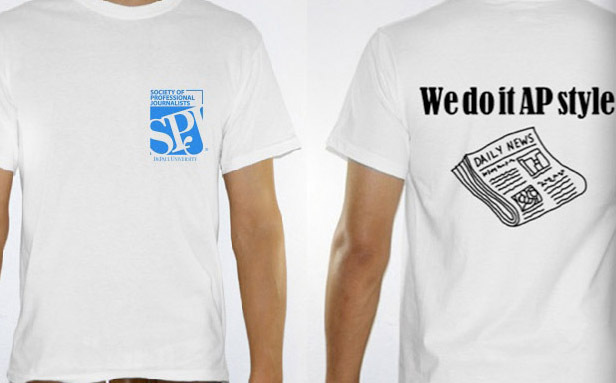 Posted byspjonadepaul	 September 4, 2012 1 Comment on SPJ DePaul Chapter T-Shirts on Sale! SPJ DePaul is selling T-shirts! They cost $10 for chapter members and $15 for non-members. They’re high-quality tees that won’t fall apart in the washer. The SPJ DePaul logo is on the front. The graphic on the back that says “We Do It AP Style”. Sizes range from small to XL and you can order as many as you like. We accept cash or check made out to SPJ DePaul. You can pick them up in Mike Reilley’s office, room 1106 at 14 E. Jackson Blvd. on Mondays and Wednesdays, 3 p.m. to 4:30 p.m.
Or contact one of our executive board members!